MEASUREMENTS: AUNE X1 (Mark I) [UPDATED]. As we all know, manufacturing capacity has shifted to Asia over the decades. Almost all the high tech gear we use in our daily lives are "Made in China" or Korea, or Japan these days. So why not commoditization of high performance audio and buying "the good stuff" from there as well? Over the last decade, there has been a nice proliferation of extremely high performing and inexpensive gear coming out of Asia available on places like eBay among other on-line merchants. Last year, I was scouring the 'Net looking for a decent headphone amp/DAC combination when I came across some good reviews of the AUNE X1. 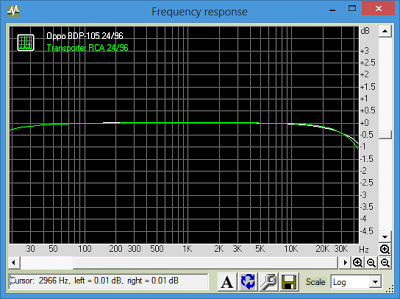 The USB implementation is the bog standard BB PCM2707 (adaptive isochronous, only up to 16/48 sampling rate USB 1). The internal DAC is the BB PCM1793. Good channel balance at full volume. 3V peak. Very nice square wave morphology. Standard linear phase response with pre-ringing. Note that the phase is inverted. Already this looks good for RCA output. Despite the asynchronous design, the 16/44 USB path measures a little better than going through the coaxial or TosLink SPDIF from the Squeezebox Touch. However, due to the limitation of the old USB1 interface, it is not capable of hi-res 24-bit data or higher sampling rates. Nice to see that the 24/192 sample rate result looks very good, essentially not giving up anything measurable compared to 24/96 using the E-MU 0404USB. TosLink just a tad noisier in the graphs above. As I mentioned above, I bought this unit as a headphone amp and DAC which I've been listening to this past year using my MacBook Pro TosLink output while doing work at night. It sounds very good - tight bass, nice stereo separation, very detailed with my Sennheiser HD800 - and can easily drive the more demanding AKG Q701 headphones to headache-inducing levels. I've hooked it up to a bookshelf system to make sure the RCA out sounded good (it does as suggested by these measurements), but otherwise have only listened to them through the headphones. 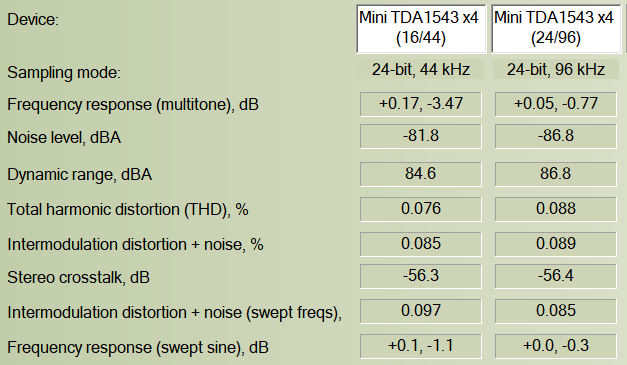 Subjectively I have not been able to tell a difference between the same 16/44 track played back using the adaptive USB vs. TosLink vs. coaxial. These days I see there is a Mark II with upgraded USB input using the Tenor chipset (up to 24/96) which should be an improvement (I see what looks like a Mark III with Wolfson USB chip up to 24/192?). This is the level of performance you get for $200USD on-line. Commoditization of hi-fi is a very good thing. 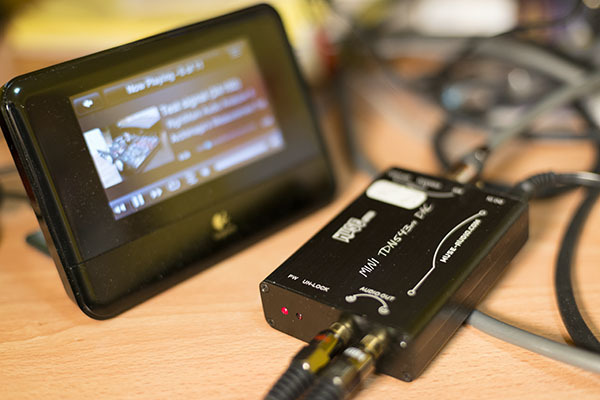 MEASUREMENTS: Oppo BDP-105 as USB DAC. 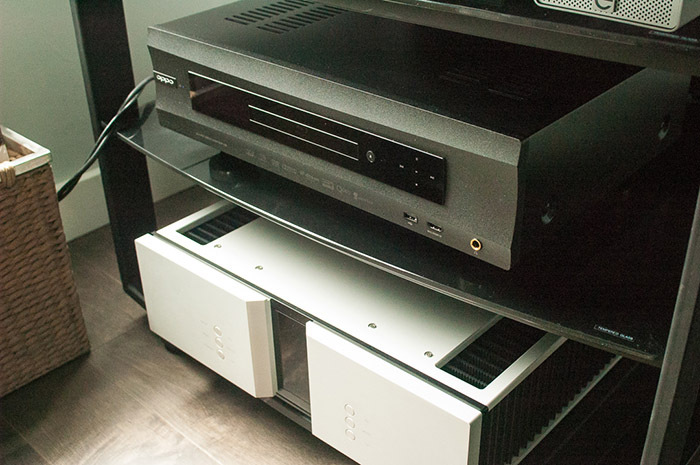 As many of you know, this is the new "jack of all trades" Blu-Ray player from Oppo. 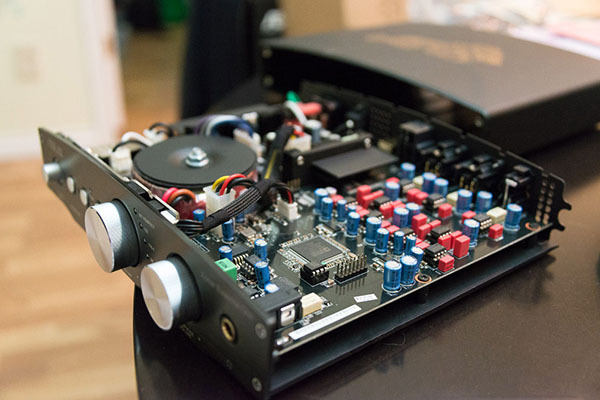 Apart from the video wonder this device is capable of (including 3D, 4K upconversion...), for audiophiles, the internal DAC is the well-respected "ESS SABRE 32 Reference ES9018" in dual configuration (quad differential stereo) and also has surround playback. The fact that it has a USB2 interface for audio clearly adds to the flexibility something like this could be used as in a HTPC setup. I believe there is also talk of being able to play DSD files from a USB stick with a future firmware update (looks "official" now, not sure if this will be possible with the computer USB2 input). This is a similar setup as what I used to test my Transporter previously. The laptops are being run on battery (if that makes any difference, could reduce AC adapter noise I suppose). Oppo currently does not have a Windows 8 driver for the USB2 port; that's why I had to use the ASUS Windows 7 laptop. We did not have any trouble with the driver so it seems reasonably stable. I actually tried to install the Win7 driver on Win8 but it refuses even with "compatibility mode". 1. I'm impressed by that 24/192 measurement. To have it not deteriorate compared to the 24/96 result speaks highly of the DAC quality. Most DAC's I've tried at this sampling rate shows deterioration compared to an "optimal" result at 24/96. 2. These are the lowest THD and IMD numbers I've been able to measure thus far. Obviously the BDP-105 is hitting the limits of my ADC. 3. I suspect the Essence One's -103dB stereo crosstalk is a result of the fact that a much shorter 3' RCA cable was used in that instance, rather than inherent superiority (Transporter was measured with similar 6' RCA cable). Really nice 24/192 frequency response curve (ahem, ASUS Essence One...). Nice! The peaks are looking like J-Test modulation only... If there's jitter here, it's totally irrelevant when playing music. Well, I got to spend an afternoon gathering the measurements and listening to this unit. What can I say... 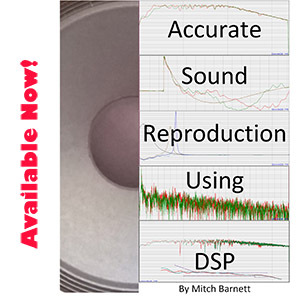 It sounds wonderful and is completely consistent in this regard with the measurements obtained. Genres sampled included vocal jazz (Melody Gardot), pop (recent Britney Spears / will.i.am :-), classic jazz "Kind Of Blue" SACD, among others - they sounded dynamic and detailed. As is, in stock form, even just measuring the unbalanced output, there's really nothing to pick at whatsoever from the measurements. I think it's fair to say this is "state of the art" (lets see if folks like John Atkinson can find fault with the pro AP gear!). With regards to the BDP-105, the best part of all this is of course... It's only $1200USD! Fantastic job Oppo and an amazing value even just as a high quality DAC! - E-MU 0404USB --> USB2 of the computer motherboard using generic USB cables. E-MU located about 3 feet from the main computer (too close results in obvious RF interference raising noise floor). A few observations: Well made DAC. Asynchronous USB interface with the CM6631 receiver. Likely much more expensive if it came from some boutique audio brand. Heavier and larger than I expected! Should be a good test of the approx limits of the E-MU as testing gear. The upsampling certainly does something to the sound and so far, I'm not a fan of what it does... Let's have a good look at it later on. 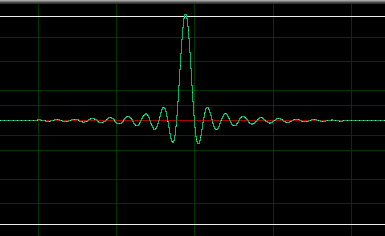 Here's what a 1kHz square wave at 24/44, 0dBFS off the RCA jacks looks like under the oscilloscope (oversampling off). Overall the waveform looks good. However there's some channel imbalance with the right (yellow) channel slightly stronger by about 80mV. 16/44 impulse response. Absolute phase maintained, linear phase digital filter. The first 2 columns are the result between using the RCA vs. XLR cables. Clearly XLR is the way to go with 5dB improvement in noise floor, dynamic range, and stereo crosstalk. Bottom line, XLR buys you about 1-bit in digital resolution according to my setup with the Essence 1. The last 2 columns are with the computer running full load (hence the note "NOISY i7"). I was running the machine full tilt with Prime95 and the graphics card inside (nVidia GTX 570) doing the "Furry Cube" demo/bechmark from GPU Caps Viewer. 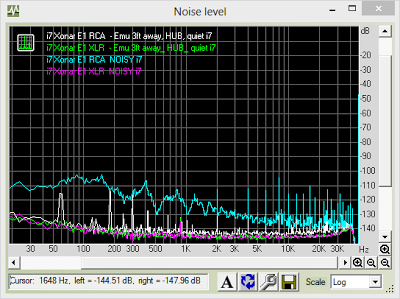 Notice how the RCA unbalanced setup resulted in significantly increased noise floor by 14dB (about loss of 2 bits resolution)! XLR setup however ran stably with no evidence of the noise pollution. No major issue since we're looking at -1dB attenuation at 30kHz. However, compared to other DAC's I've tested, the drop off does seem steeper than I had expected. (I'll speak more about frequency response issues later). Clearly the "RCA NOISY" spectrum (cyan) is much inferior to the others. However, the RCA "quiet i7" (white) has a number of spikes evident including a -115dB hump at the 60Hz powerline frequency (IMO this is inaudible at normal volumes). 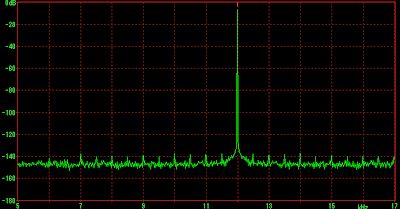 Again, as above, the RCA output shows electrical noise pollution. Remember though this is essentially a worse case scenario with the CPU & GPU running 100% full tilt which should never be the case if you're trying to listen to hi-fi music! That's pretty good. 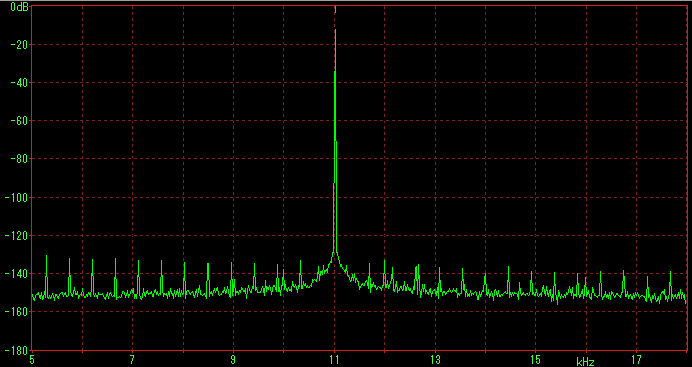 The occasional spike down at about -120dB below the peak, sideband well controlled. I doubt this level of jitter would ever be audible with human ears as a test signal and IMO impossible with actual music. 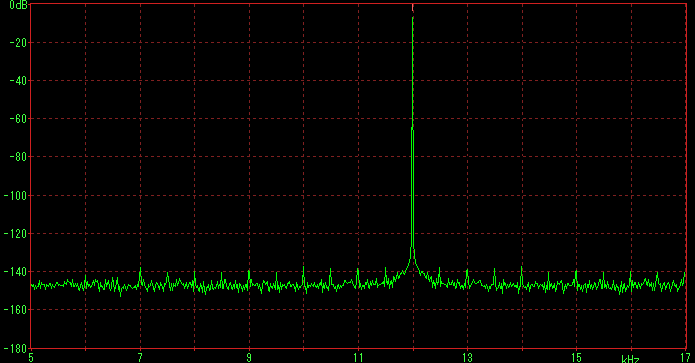 There's now a "bump" down at 8-9kHz range, about 110dB below the 12kHz peak. Looks like electrical noise; not jitter. If this is all that happens with a large unrealistic load (100% CPU and 100% GPU load ain't something you'd likely ever do while trying to enjoy high quality audio! ), I say don't waste time stripping down the OS! Pretty much like the standard jitter FFT above, no change whether upsampling on or not. At least for the Essence One, no evidence that upsampling helps reduce jitter. 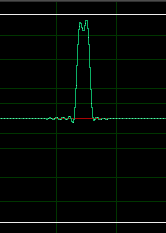 No matter which input selected - USB, coaxial, TosLink - activating the upsampling feature (front button) results in quite a nasty lowpass BELOW 15kHz! This is clearly audible to most young people and probably to a number of older audiophiles :-). ASUS, what's going on here?! No difference between standard and upsampling turned on! But they BOTH drop off together down to -5dB by 50kHz. So far, I have not seen ASUS respond to this and I can only assume that at least in the case of 44kHz, there is some kind of BUG in the firmware causing this issue since that 15kHz drop off is quite noticeable. Although not perceptible, the high frequency roll off at 96 and 192 kHz sampling rates also seems a bit premature compared to other DAC's I've tested. Basically what they did with introducing an earlier roll-off is to reduce the pre- and post-ringing on the impulse response... I assume the above is intentional. Seriously, not a reasonable price to pay for the loss of the high frequencies! Subjectively, I like how the Essence One (upsampling OFF) sounds - nice and clean, detailed, good rendering of dynamics... It certainly has the oomph to drive my AKG Q701 headphones (compared to the E-MU 0404USB) and the Sennheiser HD800 has never been this detailed. The dual volume controls (main speaker out + headphone) was a major reason I bought this for my computer workstation listening. Drivers are also much less buggy than the E-MU and the ASIO works well without any issues switching back and forth between sampling rates. If you can, I highly encourage use of the balanced XLR output. With my testing setup, the XLR proved to be resilient to electrical noise and lowered the noise floor by around 5dB (not likely audible but nice to know!). BUT, I cannot recommend this DAC wholeheartedly until they fix that really strange frequency response issue with 44kHz sampling rate and upsampling. Strange that ASUS would hype up the "symmetrical upsampling" as a feature but in reality IMO noticeably worsening the fidelity when you turn it on! I also don't know why there's a premature roll off at 96kHz and 192kHz even when the upsampling algorithm isn't activated... It'll be nice to hear an official response from ASUS about this - is this intentional!? Other than some astute comments I've seen on message boards, it's interesting that most 'official' reviewers have not mentioned this rather obvious anomaly. If you guys are looking into this frequency response issue with upsampling, why not just implement a minimum phase filter with slow roll off from about 18kHz for the 44/48kHz sampling rates? This is of course a bit of what the big boys like Esoteric, Ayre and Meridian have been doing over the years. This is the ancient Philips TDA1543 DAC (data sheet says 1991), 4 chips in parallel - supposed to improve noise measurements. This particular model is the MUSE Audio one you can find on eBay for about $60 with case & wallwart... For this test, I actually ran it with a better AC adapter (Samsung 12V, 2A unit). The DIR9001 digital receiver in this unit allows up to 24/96 but the TDA1543's are 16-bit chips which I presume will truncate 24-bit data. Setup: Touch (WiFi) --> proper coaxial cable --> TDA1543x4 DAC --> shielded RCA --> E-MU 0404USB. 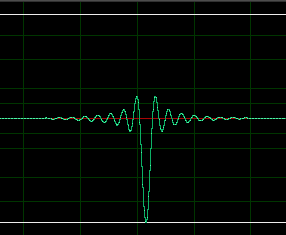 As per my recent testing methodology, let's start with the oscilloscope graph of a 0dBFS square wave at 24/44 (note this is only a 16-bit DAC so cannot benefit from the extra bit depth). 2.85V peak. Some aliasing evident. Otherwise, relatively well formed square wave. 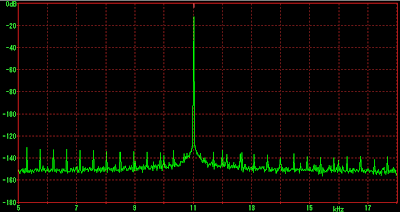 I suspect the ADC is adding a bit of the pre-ringing... Otherwise, this is as expected from a NOS DAC - no ringing due to lack of digital filtering. Absolute polarity maintained. Frequency response drops off at the upper end on NOS DAC's at 44kHz sampling rate and you can see that quite clearly above - this improves significantly with 96kHz. Looks like the performance overall improves with 96kHz sample rate except for the stereo crosstalk which remains quite poor (even worse than the SONY CFD-S05 boombox). Many folks who use NOS will upsample the data before feeding into the DAC to take advantage of this fact. 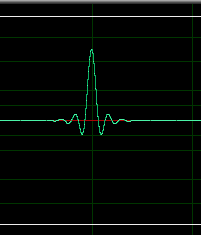 Jitter (16/44 Dunn J-Test) - Due to the stair-stepped aliased nature of the sine waveform, some of this is distortion but most of it is jitter sidebands. Well what can one say about NOS DAC's like this... They measure poorly. Yet, many swear by them. Sure, this is an inexpensive NOS and there are much more expensive ones out there like the AudioNote products (the AudioNote DAC 0.1x looks like it only has a single 1543 and upper models all seem to use the AD1865 - don't you love their term "1x oversampling"?!). Personally, I find the sound isn't bad. It does have the high frequency roll-off which works OK for fatiguing music but that also takes away some of the "sparkle" in good studio productions. Goes to show just how amazingly tolerant hearing can be! MEASUREMENTS: What 'lo-fi' looks like (SONY CFD-S05). I realized over the weekend that it has been at least 10 years since I actually played any cassette tapes! My dad was interested in getting some old cassettes transferred and I discovered both my cassette players at home didn't work. The Sony CFD-S05 does a lot for $60. It's a smallish boombox CD player, cassette player, AM/FM radio... Even has a little phono plug input up front for iPod's and the like. Since the cassettes I wanted to transfer were mostly >30 years old, I certainly did not need a Nakamichi. As a "utility" audio player for the kids, although this unit isn't $20 like the absolute cheapest in the store, I suspect this is the kind of lowest end "quality" most of us would be willing to have around the house. Therefore, I figure it might be interesting to measure this unit as a "point of reference" as context to the other measurements and consider what $60 buys. Set-up: SONY headphone out (MegaBass off) --> 0404USB, shielded phono to RCA RadioShack cables. Test signals burned on Fujifilm CD-R at 24x (no fancy media here or extra-slow 1x burning). As you see, I've added the SB Radio, Boom, and Touch as comparisons. Note that the Radio and Boom were also measured from headphone out while Touch was with the standard RCA line out. Clearly, the Sony was outmatched by all the others. The Sony's dynamic range is about 12-bits due to high noise floor. Again, quite poor. The elevated noise floor is clearly an issue. Well, it's not good but... At ~90dB between the 11kHz signal and the tallest sideband, I'd say this is actually not terrible either! I'd be much more concerned about the other results and especially that horrifying frequency response than care about the jitter. Not unexpectedly, this is clearly not "hi-fi" (no kiddin'!). 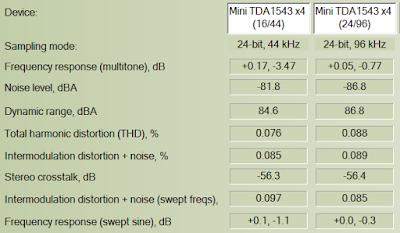 Subjectively when I plug in headphones, it's the frequency response that most noticeably makes it sound poor (gutless bass and accentuated treble, no wonder Sony included the "MegaBass" button); plus the noise level is audible with volume up a bit. I suspect that the frequency response curve was purposely "tuned" to make it sound better with the small built-in speakers (single driver) rather than achieve flat response which should be trivial with any modern DAC. Rolling off the low bass to remove rattling & midrange distortions and boosting the treble to compensate for the lack of a true tweeter. To not turn off this compensation when using the headphones is a sign of "cheapness"
Having said the above, also consider that some high-priced gear have really bad measurements yet get praised during subjective evaluation (I'm not going to name names here but look through some of Stereophile's measurements on-line). Of interest is that the jitter test was the least concerning result even in such an inexpensive unit spinning physical media. MEASUREMENTS: Logitech Squeezebox Boom & Radio. Well, the Radio is (sadly) the only Squeezebox device still in production these days. DAC is the TI TLV320AIC3104. I calibrated the headphone output to my E-MU 0404USB, WiFi streaming, measured with the usual i7 workstation. Not expecting hi-fi performance out of this unit of course and pretty well got what was expected... Overall, an OK performer in the 16-bit domain for music streaming duties and incapable of taking advantage of 24-bit audio with only a measly 1dB improvement in dynamic range. For posterity and completeness, here is the SB Boom. Internal DAC is the TI TAS3204. Like with the Radio, this was connected from the headphone out in the back --> E-MU 0404USB, WiFi streaming. Again, not a hi-fi unit by any means. Good dynamic range but stereo crosstalk is a bit on the high side. Like the Radio, you can see a slight improvement with 24-bit data but not much of an improvement to call it worthwhile. It sounds great as a stand-alone system which is all I really use it for in the living room. This weekend, I decided to hookup the Behringer DEQ2496 digital EQ processor to the test gear and see how this measures. Normally, this unit is set up to provide room EQ via a digital loop with the Transporter so I've rarely had a listen to the analogue outputs. Internal DAC is the AKM AK4393, the little brother of the Transporter's AK4396. About 6 months ago I actually hooked the DEQ4396 to the main system to have a listen and I must say that I had a difficult time telling the difference AB'ing it with the Transporter (when I normalized the volume on both) so I have some idea that it likely measures quite well. The set up for this: Transporter --> TosLink --> Behringer DEQ2496 --> XLR --> E-MU 0404USB --> AMD Phenom X4 laptop. All plugged in to the Belkin PureAV PF60 power conditioner. I noticed that for the 24/96 test condition, the Transporter's frequency response is significantly flatter than the DEQ2496. Differences are essentially ultrasonic in any case. This is where I'm "disappointed" with the DEQ2496. It appears to have poor jitter rejection at least with the TosLink interface. The reality of course is that in real music, I still can't say I can hear this. BTW, the DSP chips are dual Analogue Devices ADSP-21065L 32-bit SHARC chips (66MHz, ~200MFLOPS). ADC chip: AKM AK5393VS. MEASUREMENTS: Logitech Touch TT3 Mod. MEASUREMENTS: Logitech Touch as transport!